Anantasana is known as side-reclining leg lift posture, since this asana is performed by reclining on one side of the body and lifting one leg upwards. You should lie down on the ground on your right side. You should actively press through the right heel, flexing the ankle and using the outside of your foot to stabilize yourself in that position. If you still feel that your position is not stable, you can brace the soles against a wall. You should stretch the right arm straight outwards along the ground and parallel to the chest, so that there is a long straight line from the heels to the fingertips of your hands. You should now bend the right elbow, lift your head slightly and support the head with your left palm. After that, you should slide your elbow away from the chest for stretching the armpit, still holding the head. 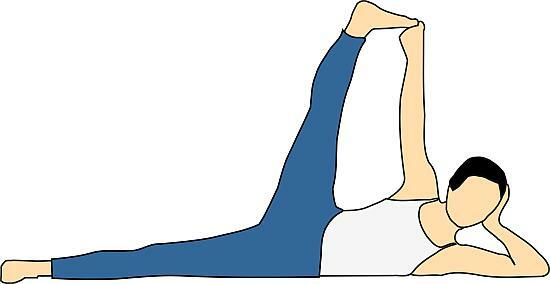 You should rotate the left leg externally, so that your toes are pointing towards the ceiling. You should bend and draw your knee towards your chest. You should reach across towards the inside of your left leg to take hold of your left big toe with the index and middle fingers. You can secure this grip by wrapping your thumb around the other two fingers. If you are not able to reach up and grip your toe, you can use a yoga strap, loop it around the ankle and hold on to the strap. You should extend the left leg upwards in the direction of the ceiling. The left leg raised is likely to angle slightly forward and the top portion of the buttocks will drop back. You should firm up the sacrum against your pelvis, creating a type of the fulcrum that will be helpful in moving the left leg slightly backwards to maintain the perfect perpendicular position. You should press through both your heels actively. You can stay in this position for 30 seconds and extend it to one minute or more later on with practice. After holding the posture, you can slowly release the left leg, exhaling and take a few slow breaths. You should now turn on to your left side and repeat the same process with the right leg. Anantasana stretches the backs of the legs and the sides of the chest, while toning up your belly. The preparatory asanas for Anantasana are Parighasana, Supta Padangustasana and Utthita Trikonasana. The follow-up asana is Adho Mukha Svanasana.